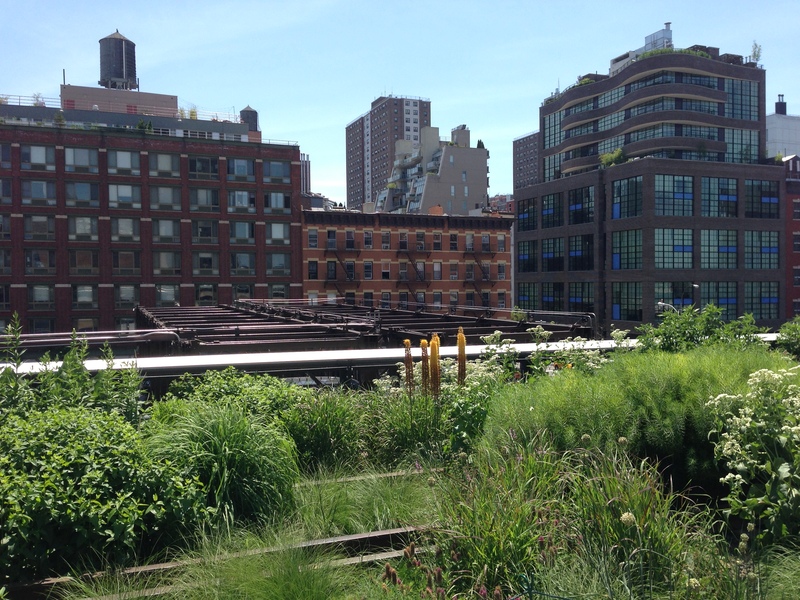 New York City’s High Line park is totally overexposed. I’m going to expose it further. 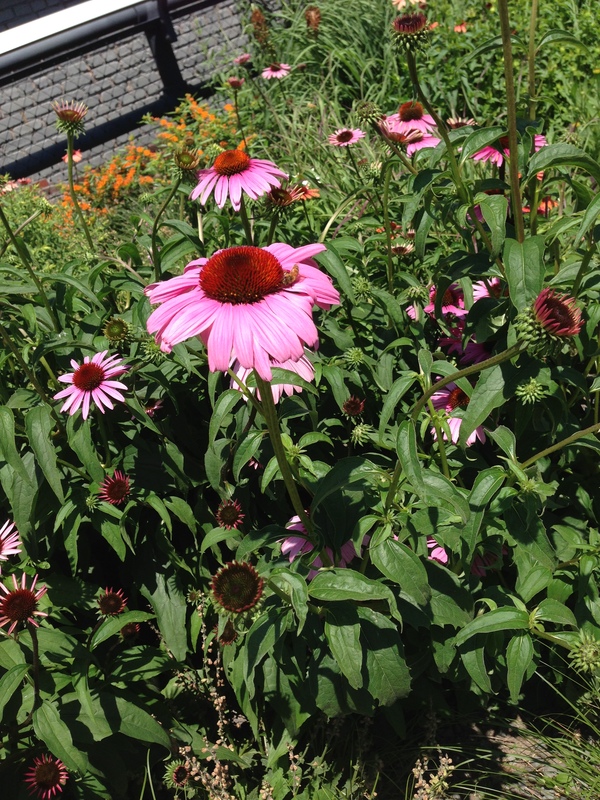 I walk with three menfolk from the top to the bottom of this new icon of the Manhattan landscape, stunned by the native plantings that seem to find city soil the best fertilizer in the world. I spent a day in the country looking at wildflowers and saw no profusion like this. And a planting of bamboo, which has to be tightly constrained by a metal guard to keep it happy in its place. Kind of the opposite of Jesse, who isn’t happy unless he’s on the open seas or in some other free environment. 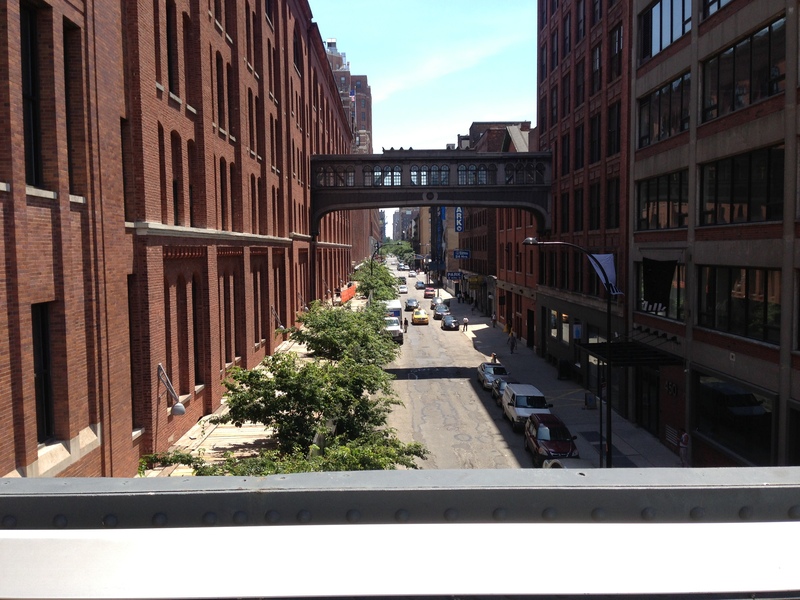 The High Line was built between 1929 and 1934 from Gansevoort to 34th Streets to lift dangerous freight trains above the traffic. For years, meat, produce and dairy products were shipped to town and arrived at the third floor level of plants. That might have been a little inconvenient, but the situation previous was insupportable. In the nineteenth century, people actually called Tenth Avenue “Death Avenue” because the street-level railroad caused so many accidents. 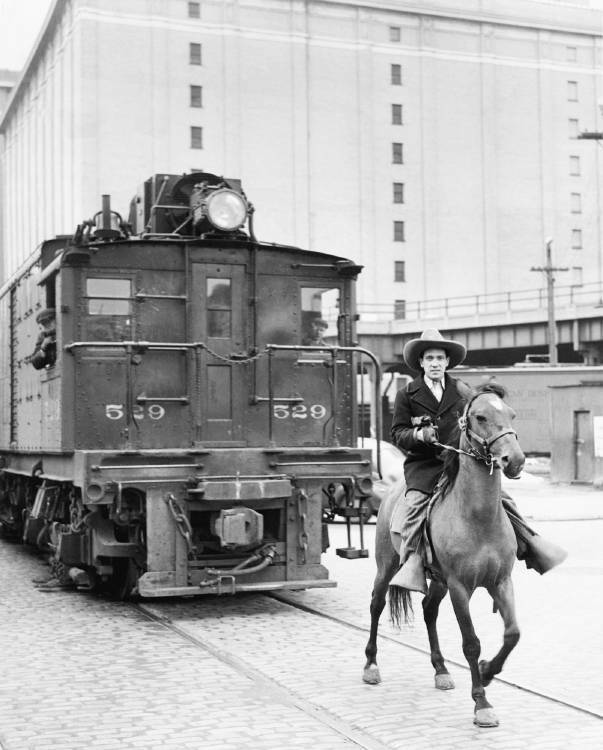 Men in an outfit called the “West Side Cowboys” were hired to ride in front of trains and wave red flags to warn traffic off. In 1980 the last train came through with a load of frozen turkeys. Then the rail bed deteriorated. 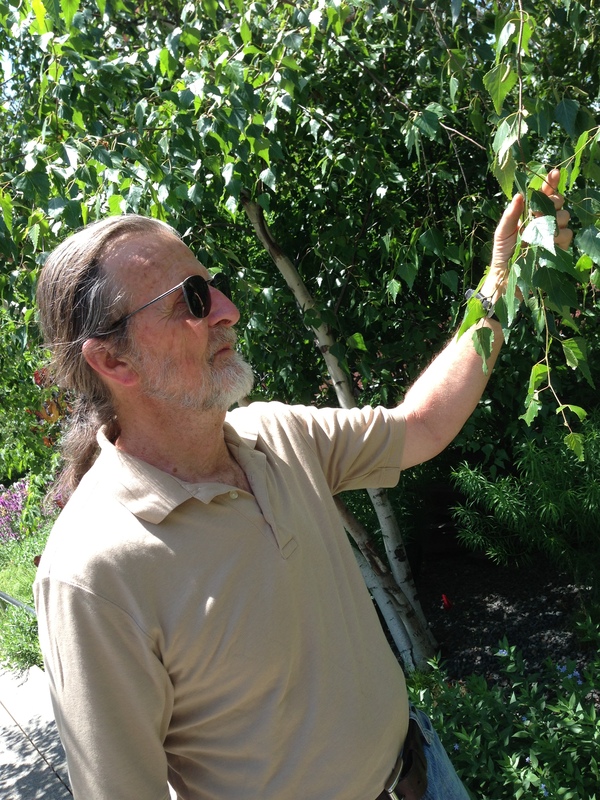 Gil, who lived in the city then, says, “It was the high line, alright, everyone was getting high.” What grew there was what the High Line people now politely call a “self sown landscape.” In other words, weeds. Weeds, condoms, syringes. Now there are trees, grasses and flowers, and I think even Larry, who lives on a farm surrounded by midwestern forest, is impressed. 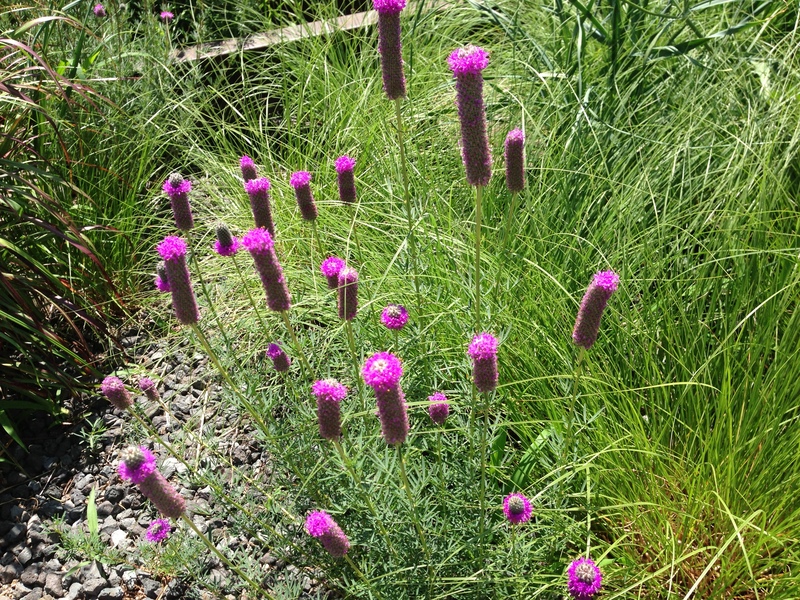 The gardeners of the High Line transformed the place, beginning in 1999. It’s a classic urban place to stop and smell the roses. Wild roses are fairest, said Louise May Alcott, and nature a better gardener than art. 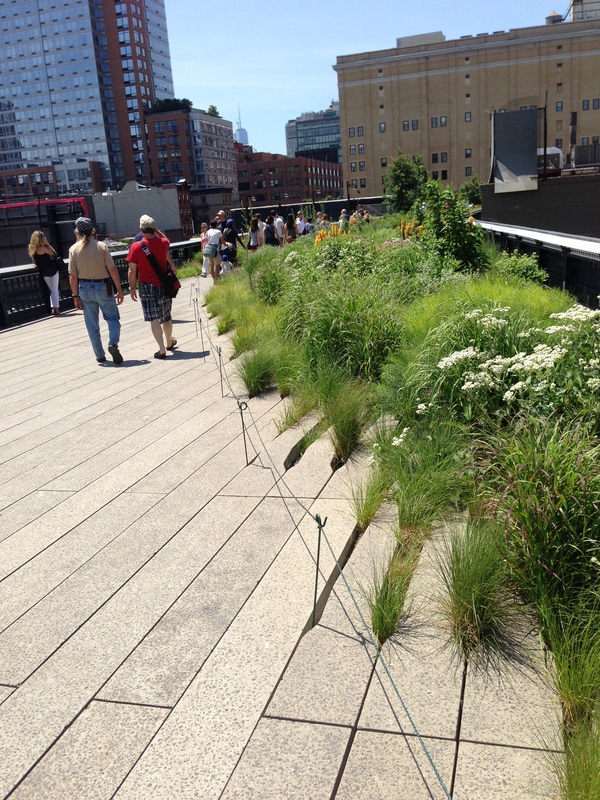 The High Line has nature, art and a third thing, a deep industrial past. Sculpture rises up along the walkway. And human sculpture, as people freeze for pictures. 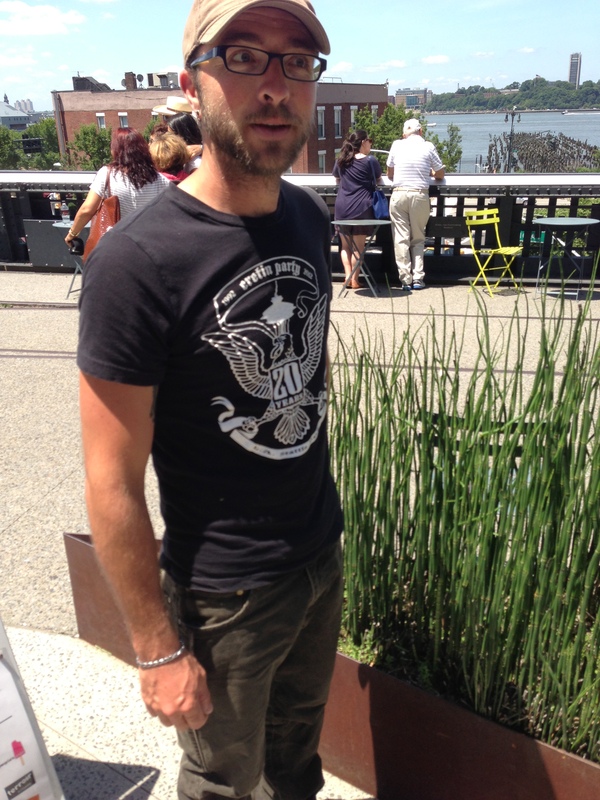 What the High Line should have next to the fresh fruit ice pops stand is a camera kiosk. Someone would get rich. Tourists throng — you can walk a long way down the path and not hear a word of English. With the new, there’s the old – a mysterious pattern of bricks. 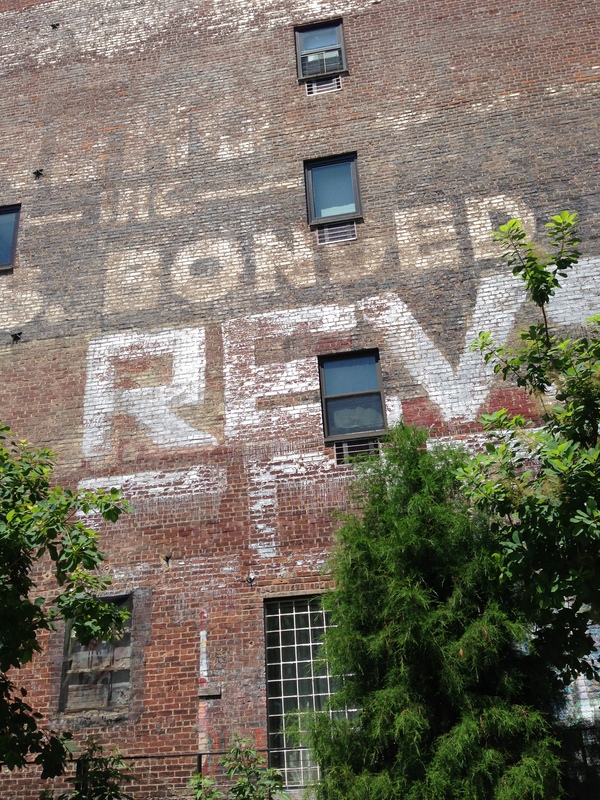 And a towering old painted sign: BONDED. Across it a tag reads REVS, shortened from REVLON, a famous graffitti artist. 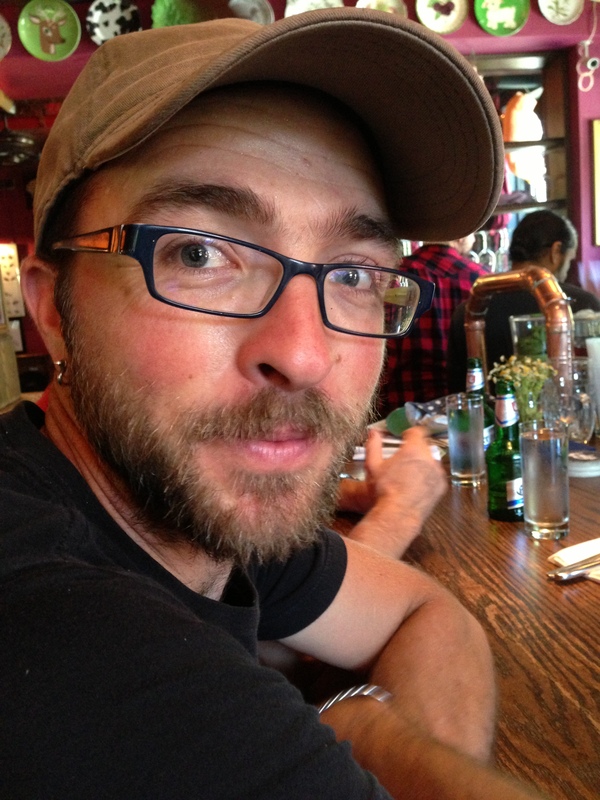 “It’s got to be on the edge, where it’s not allowed,” REV has said. There’s room on the High Line for all vintages. 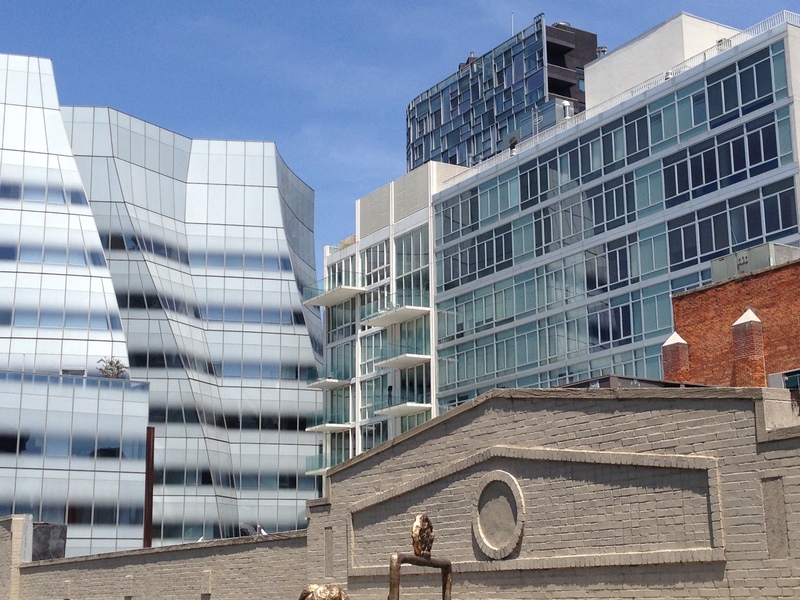 The Gehry-designed IAC Building, at 555 West 18th Street, with its milky, origami exterior, has been open since 2007. Vanity Fair called it the world’s most attractive office building. It’s especially great to see it in tandem with structures of other vintages, including the old-fashioned piedmont of a lower one whose top is flush with the park. 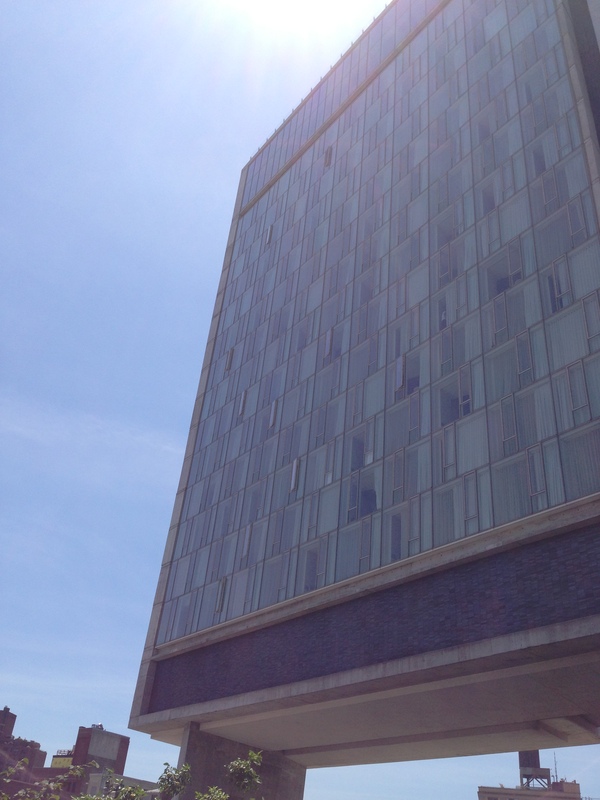 The Standard Hotel soars above. 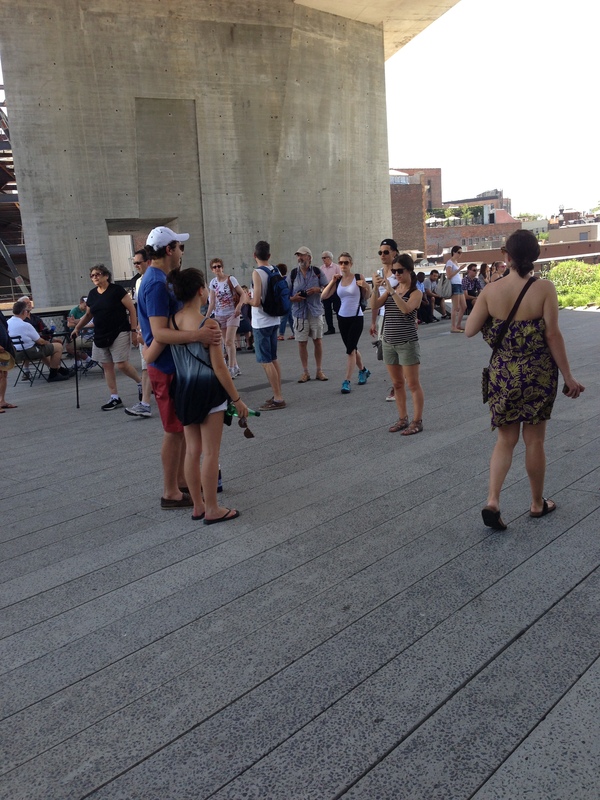 It gained some notoriety when High Line strollers realized they could look up and see happy exhibitionists making whoopee in the floor-to-ceiling windows. (When Chuck Barris was looking for a word to meet the network censors’ standards on the Newlywed Game, the term ultimately settled upon was whoopee.) Meat trolleys for hanging beeves still exist if you look closely. 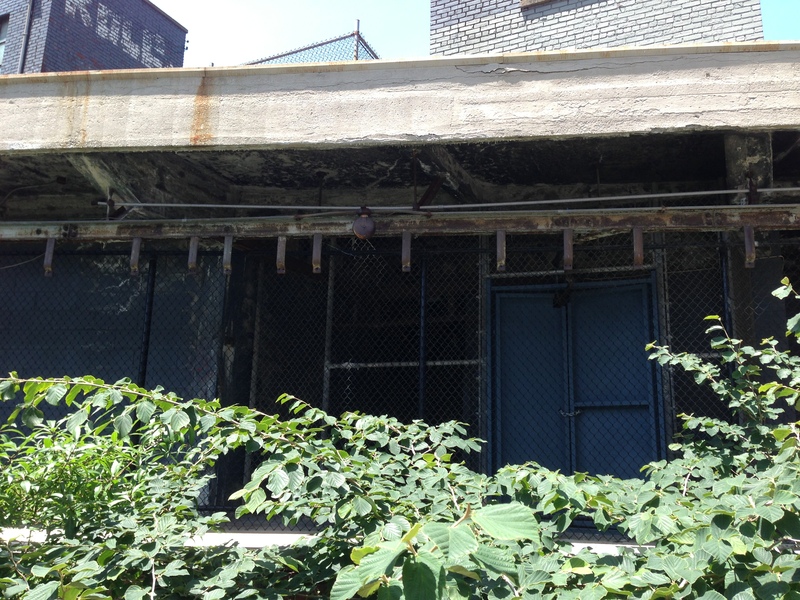 Right along the Standard, in the shadows, a rusted remnant of the district’s sanguinary past. 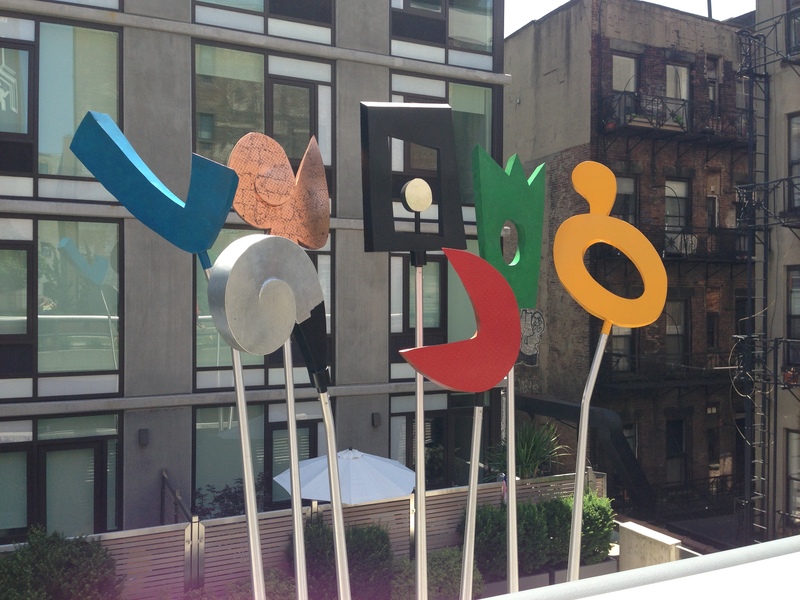 But one essential thing about the High Line is the views. In the nineteenth century, landscape architects carved out pastoral views on grand country estates, cropping trees advantageously to accentuate vistas of rivers, mountains, or other natural elements. The High Line is the 21st century equivalent, with quirky street perspectives all around, framed from this tall iron structure. 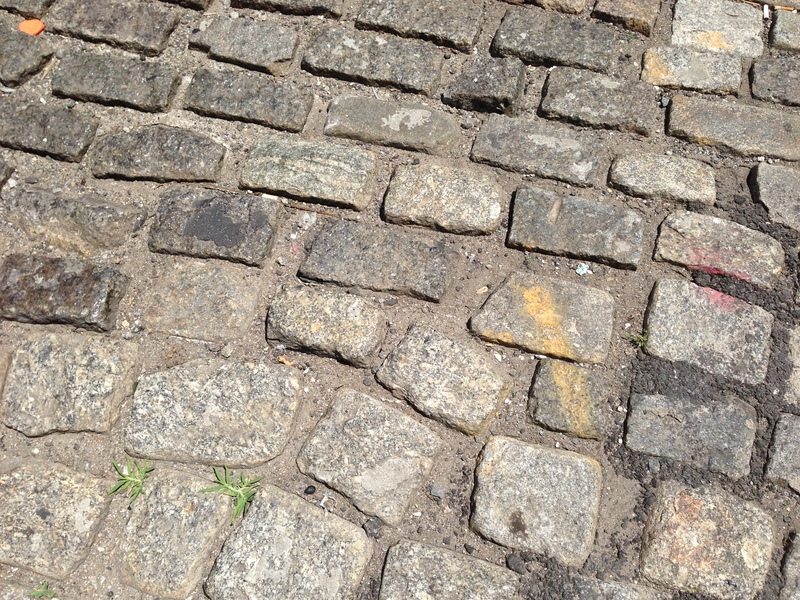 After our promenade, we descend to vintage New York cobbles. A remnant of the lost city. 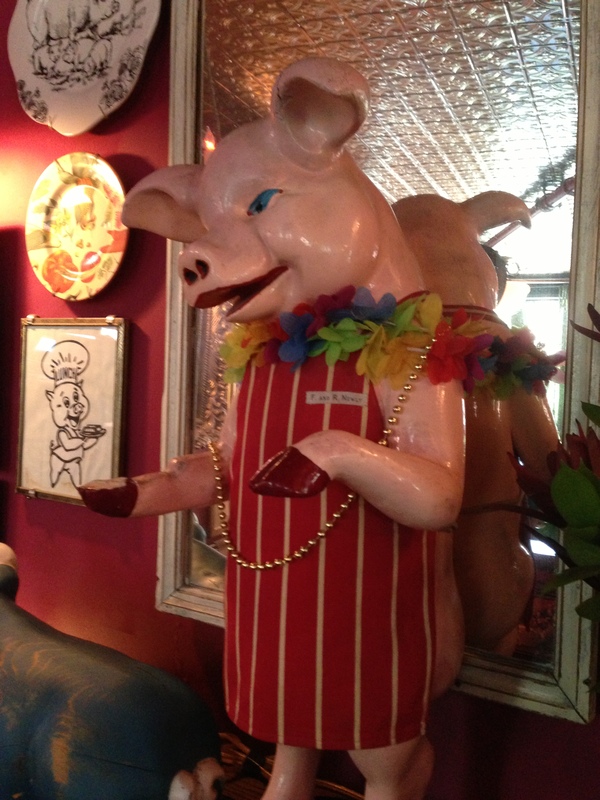 We refuel at a restaurant called The Spotted Pig. 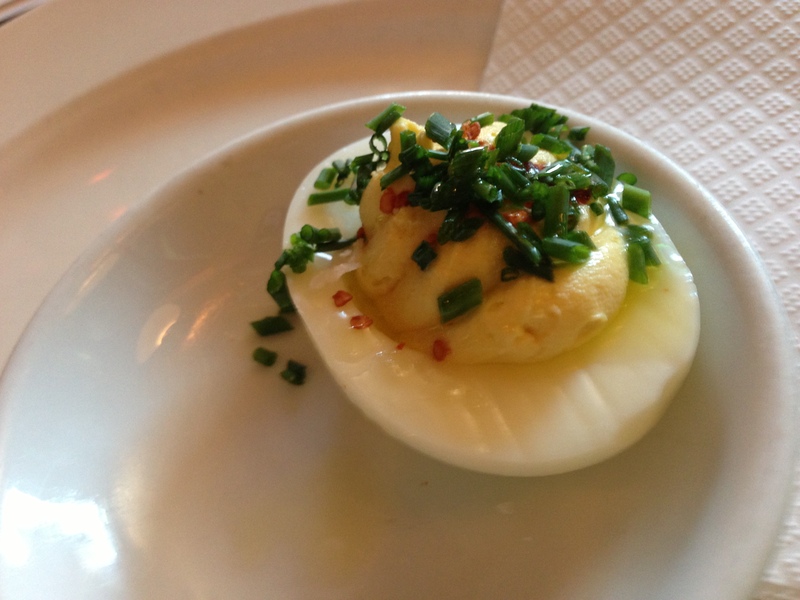 The eggs it serves are divine, with crunchy flecks of sea salt. I am tired after our sun-blasted walk of a two miles. Jesse is wide awake, which he always is, except when he’s asleep. 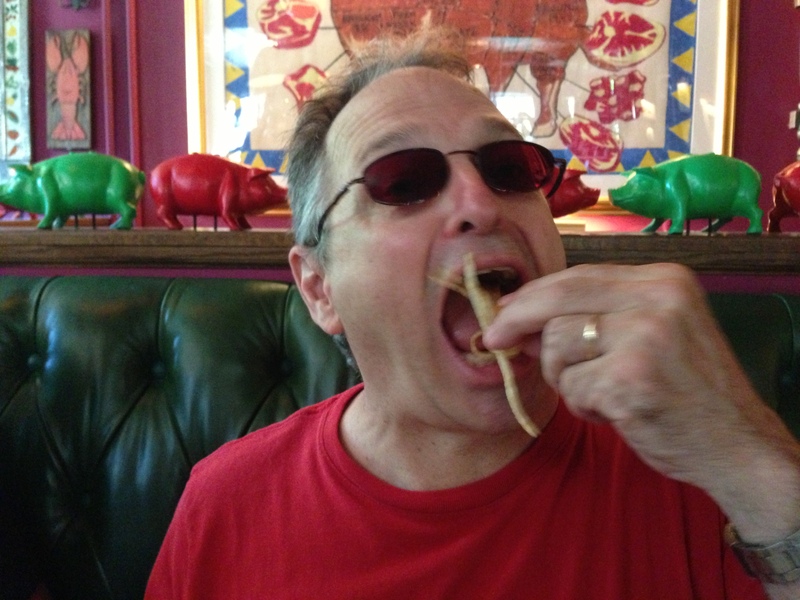 And the french fries… well, it is hard to shovel them in fast enough. The chef strews the shoestrings here with shreds of rosemary. 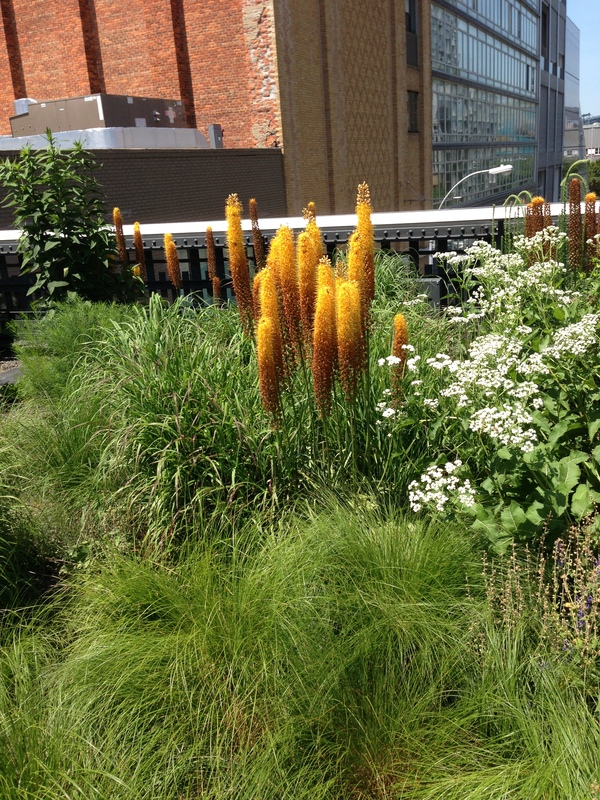 Everything tastes better after the High Line. 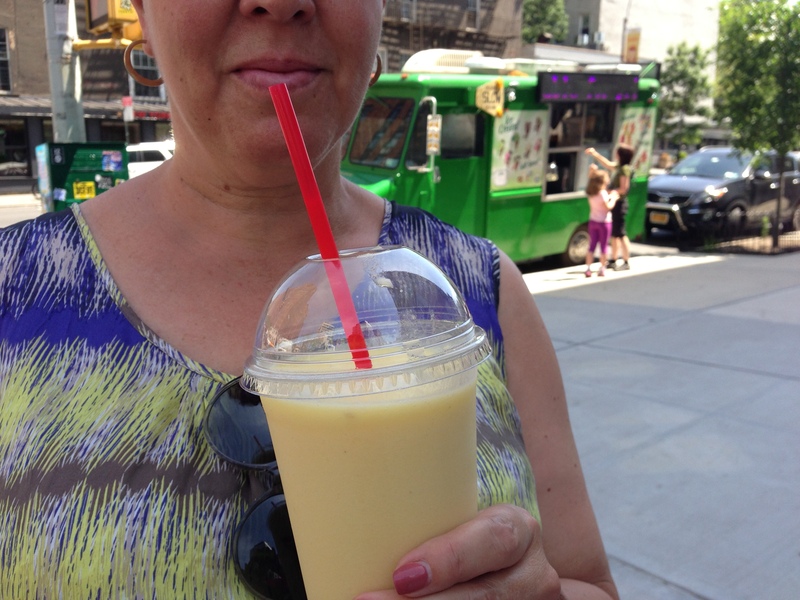 An ordinary pinapple smoothie from a new perspective. A fantastic church frieze overhead. Had it always been there? I can’t recall. The galleries of Chelsea are closed on Sunday, but that doesn’t mean the great sidewalks of New York are closed for business. 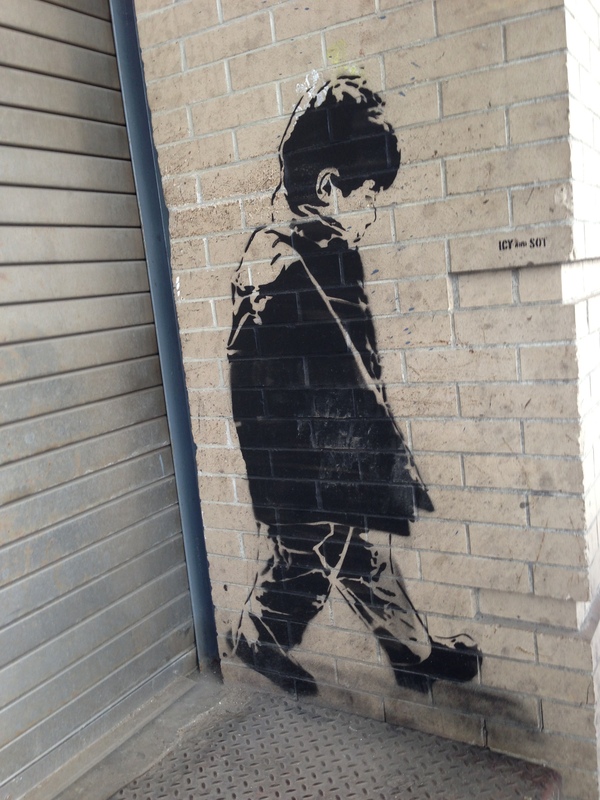 Too much graffiti has been scrubbed off in recent years. Manhattan is the new Minneapolis. Now we have clean, healthy biking all over town. 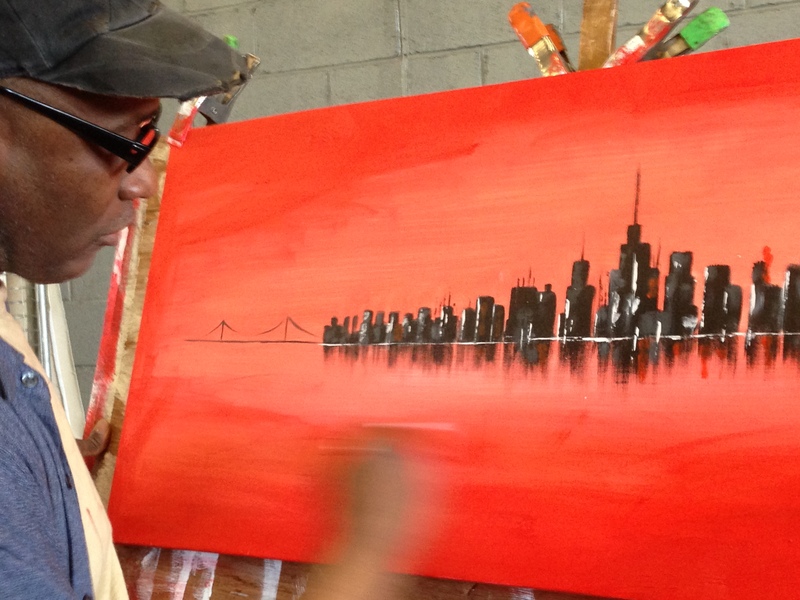 In Greenpoint, Brooklyn, where I visited a week ago, it’s a different – and more colorful – story, as it hasn’t quite shed its industrial past and makes a fine canvas for folks who do outdoor outsider art. 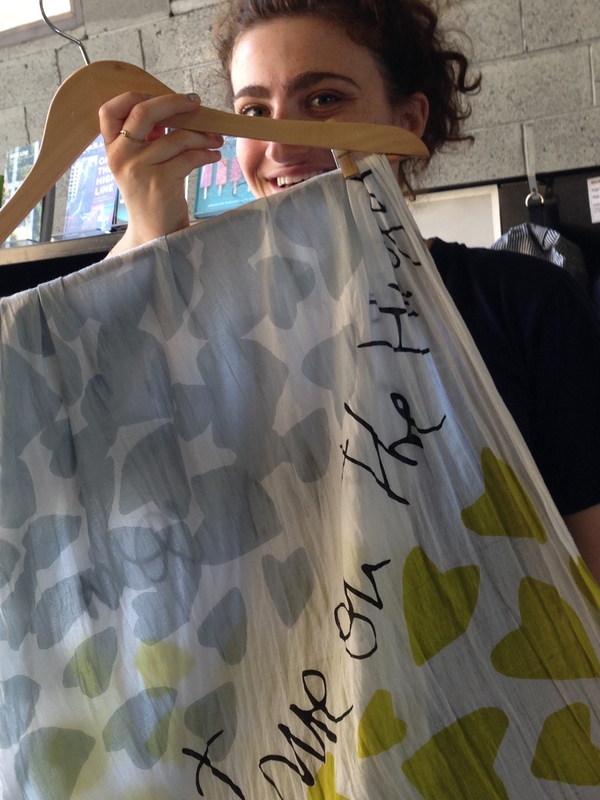 Here in the Meatpacking District we find a few worthy efforts. 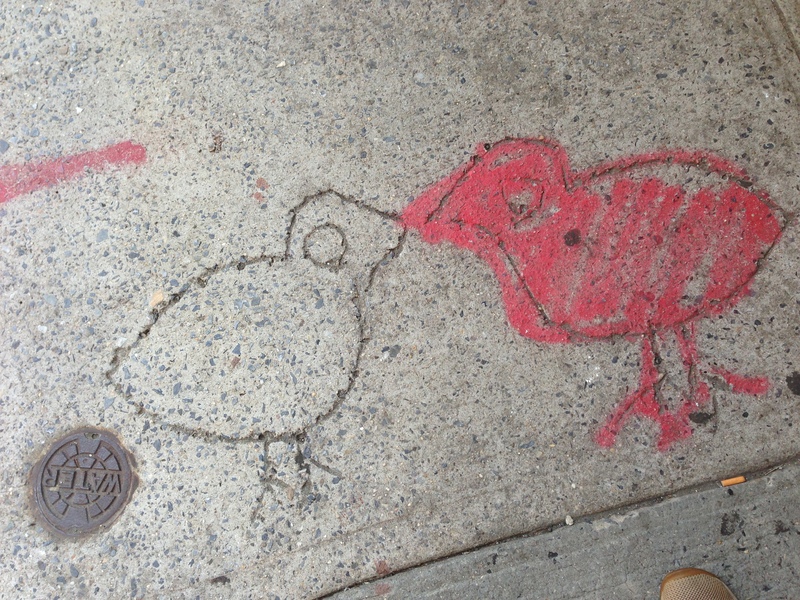 Two chicks etched on the sidewalk beneath our feet. For some reason I like these simple birds, making kissy next to their little water fountain. The all-seeing eye. 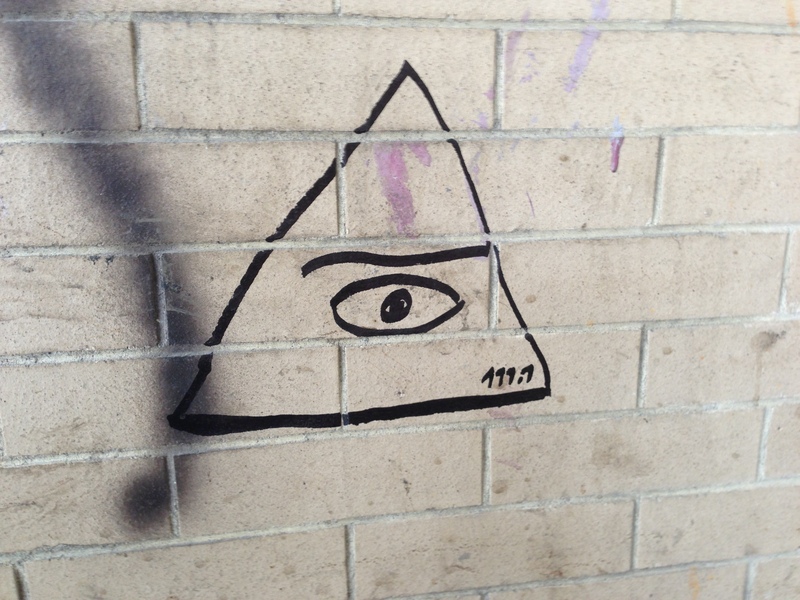 The Eye of Providence. 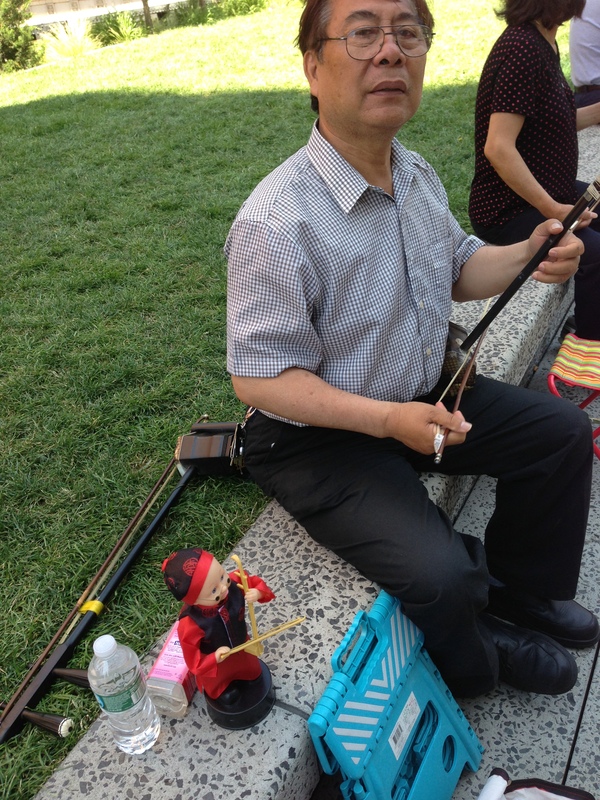 On the island of Manhattan, if you let your vision wander up, you see some marvelous things. A blue horizon chockablock with architects’ freshest concoctions. 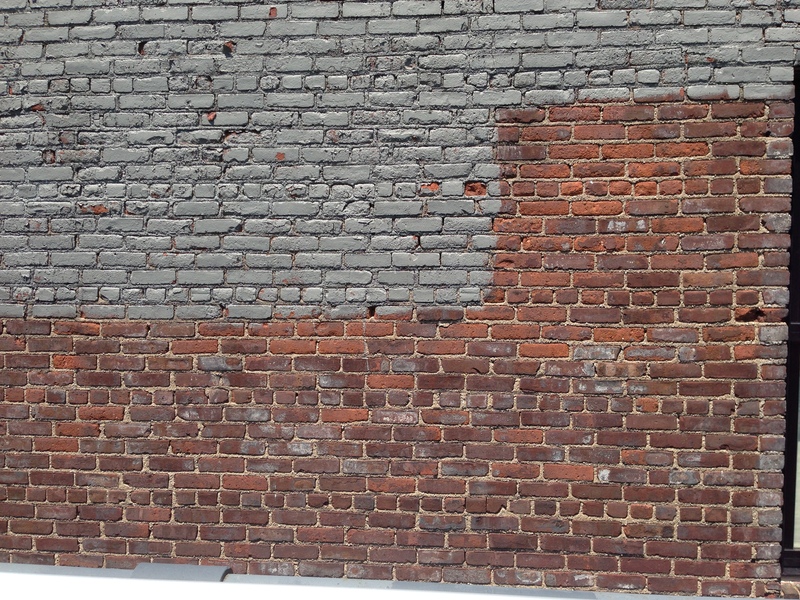 Pieces of old New York, dusty red bricks that have miraculously been saved from the wrecking ball. 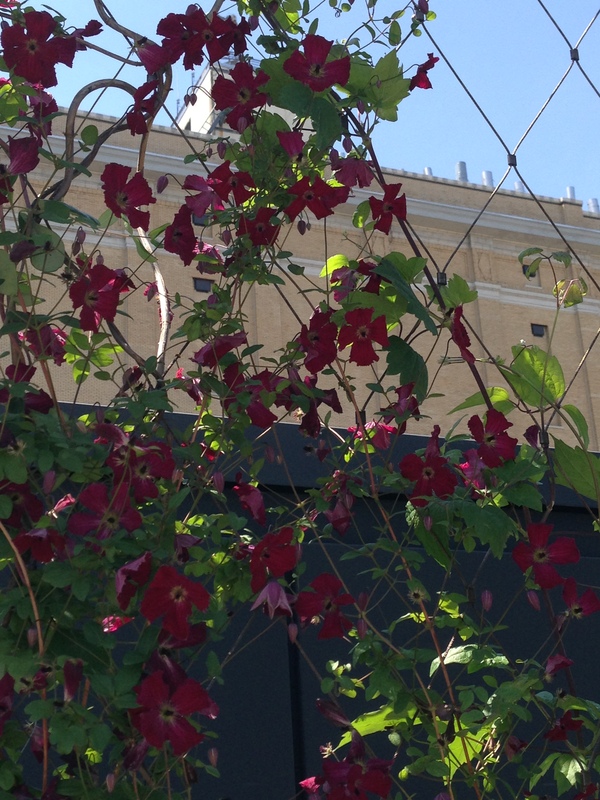 Climbing roses, if you’re walking the High Line. From that same pathway, a glimpse of a well-to-do fanny in a chic hotel window. And there are still wooden water towers. Just two companies, Rosenwach Tank Company and Isseks Bros., manufacture the tanks, which are unpainted and made with untreated wood. 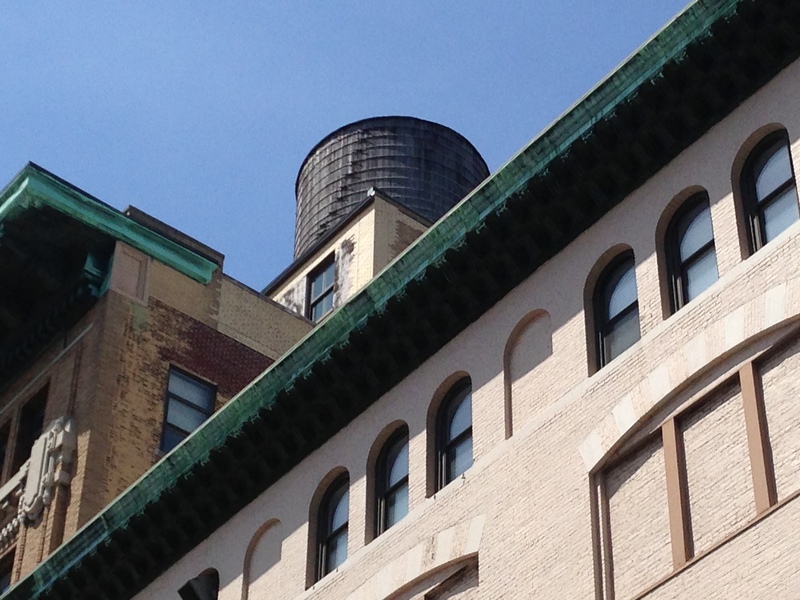 A new water tower is a leaky water tower, as it takes time for the material to become saturated and watertight. Chelsea has one, completely dry of course, that has recently been transformed into an exclusive club called Night Heron. 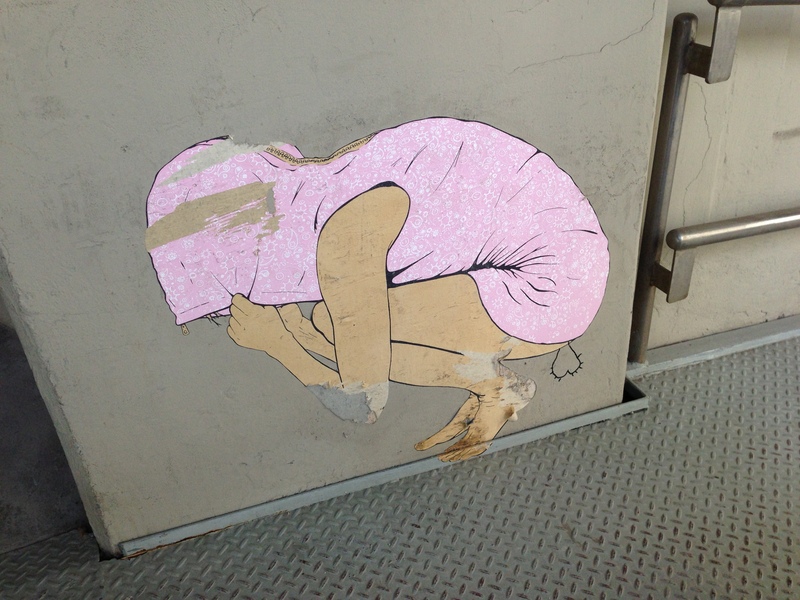 You can see it from the High Line.